Macarons are the new cupcakes, it seems. They’re made with beaten egg whites, powdered sugar, and ground almonds or almond flour. They’re a bit finicky to make, what with grinding the almonds, resting and piping the batter, and drying the cookies. Macaroons (note the two “o”s), on the other hand, are simple. I’ve been making Alton Brown’s toasted coconut macaroons for years now. They’re about as guilt-free as you can get (egg whites, coconut, and a bit of sugar — that’s it). The cookies are melting and chewy at the same time, and the coconut isn’t overwhelmed with too much sweetness. They’re even better with a few chocolate chips nestled in the strands of coconut. Alton toasts the coconut, which really develops the flavor. I spread mine on a small baking tray and set my toaster oven at 350 degrees F. You can do it in the regular oven or even in a skillet on the stove over medium-low heat. Just as when toasting nuts, you need to keep an eye on things, since the coconut can go from toasty to burned in a surprisingly short amount of time. A few tips for whipping egg whites: Get the whites into your bowl before you toast the coconut. Room-temperature whites will whip better. Also, if you have any hope of whipping those whites to nice stiff peaks, fat is the enemy. One tiny bit of grease will leave those whites flat, so you must start with a spotlessly clean bowl and beaters. Speaking of avoiding fat, separate each egg over a small bowl, then pour the white into your mixing bowl. Yes, this means you have another dish to wash, but you avoid the risk of a broken yolk (the fatty part of the egg) getting into the whites and ruining the whole batch. Fold the cooled, golden coconut into the beaten whites, add a few chocolate chips, and drop by spoonfuls onto a cookie sheet. That’s it. No piping bags, no resting the batter, no rotating of pans. Heat the oven to 350 degrees F. Line a large cookie sheet (or 2 small ones) with parchment. Get the egg whites into your mixing bowl and set them aside to come to room temperature. 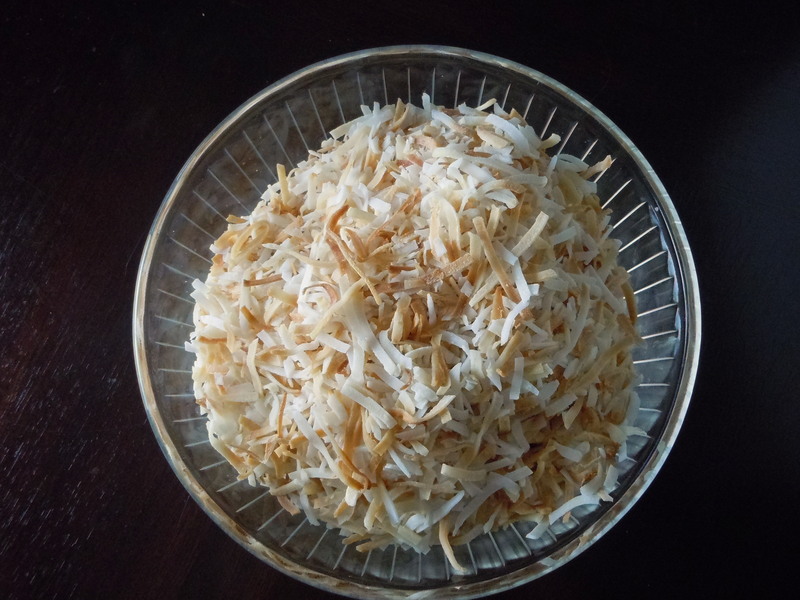 Spread the coconut in a thin layer onto an ungreased small baking sheet. 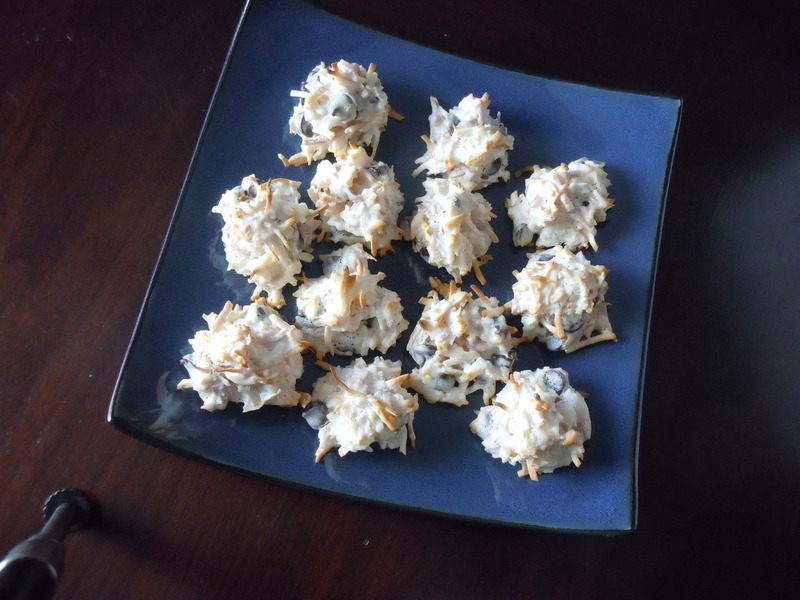 You can put the coconut onto a sheet of parchment paper on the cookie sheet you plan to use for the cookies later. (I toast mine in our toaster oven.) Toast for about 10 minutes, stirring once or twice, until the coconut is golden and fragrant. Watch carefully; it does burn easily. Set the coconut aside to cool. While the coconut cools, whip the egg whites with a stand or hand mixer (or with a whisk if you possess amazing arm strength) for a few minutes until they’re thickened and becoming opaque white. Sprinkle in the salt and roughly 1 tablespoon of the sugar and keep beating. Keep beating and adding sugar until the sugar has been beaten in and the whites have formed stiff peaks. Gently fold the coconut and the chocolate chips if you’re using them, into the stiff whites. Mound the batter by heaping teaspoonfuls onto the parchment-covered cookie sheet. The cookies don’t really spread, so you can place them fairly close together. Don’t flatten the batter; the cookies will have a nice, chewy interior if you keep the mounds high. Bake the cookies for 12 to 15 minutes until the cookies are lightly browned on top. Cool on a cooling rack. Store at room temperature in a tightly covered container. This entry was posted in baked goods, sweet stuff and tagged chocolate, chocolate chips, coconut, cookies, macaroon. Bookmark the permalink. Oh, I never knew the difference. These look so easy, I think I’ll try them. What do you do with your egg yolks? Seems so wasteful to just throw them out. And I’m the only coconut eater in the house, meaning I get to eat them all! Ha! Jennifer, they are really easy and fast. 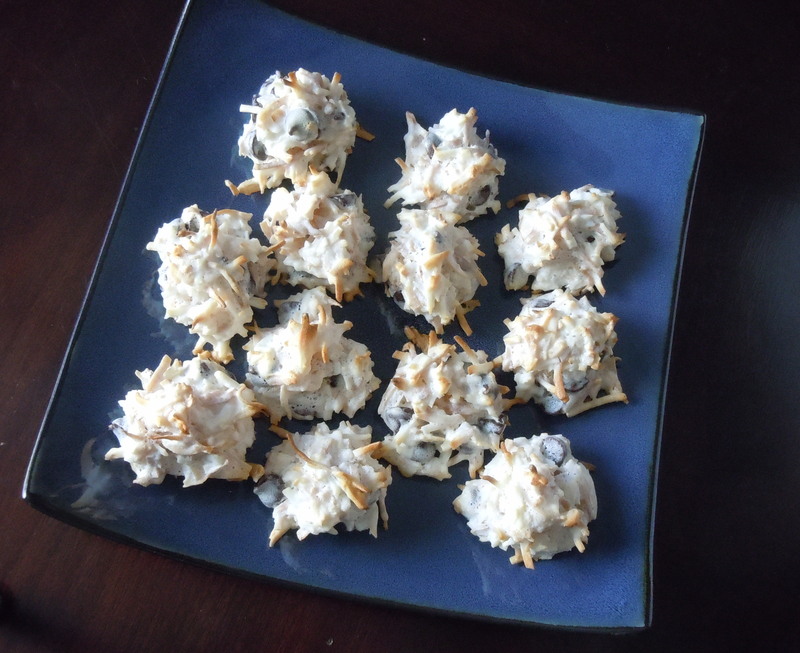 My husband is not overly fond of coconut but likes these, so maybe you’ll have to share. Technically, you can freeze yolks; I confess I just toss them, sinful as that is.